Flying Storks is a Stork Sign Business serving the areas of Maryland & Northern Virginia. 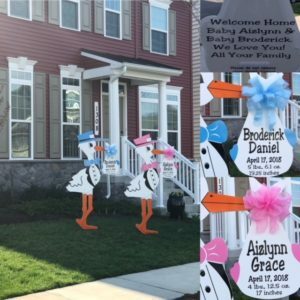 We help welcome home new baby with Personalized Stork Lawn Sign Greetings. And don’t forget BIG Sister or Proud BIG Brother, Send a Sibling Sign too! As soon as the baby arrives, give us a call to request a Flying Stork delivery. We strive to have Flying Stork Sign delivered before mother and baby arrive home from the hospital. For a Flying Stork Baby Shower or Gender reveal, a two week pre-order is a good idea. What information do I need before placing the order? The spelling of the baby’s first and middle name, weight, height, and date of birth. We also require the delivery address, phone number, gate code if applicable and if there is a sprinkler system in the yard. How do I place my order and pay for the rental service? Most orders are made via phone to (301)606-3091, or by completing the order form on our website. You may also email us at FlyingStorks@gmail.com with all the necessary information to get it started.